A work colleague suggested a scent idea/theme for a hand soap after discussing the Storm Rose hand soap project that I did w/ my daughter. I then discussed the idea with my daughter and she named the project 'Phoenix'. This is the first time I've had a go at 'swirling' colours. Ingredients: Palm oil, Olive oil, Tallow (Beef), Shea Butter, Coconut oil, Castor oil, Sodium lactate, Vit E, Glycerine, Beta Carotene, Mica, Filtered Water (RO), Sodium Hydroxide, Essential oils. Essential Oils: Sweet Orange, White Birch, Bergamot, Vetiver, Aniseed Myrtle, Ginger, Sandalwood. The overall scent theme is smokey orange with some earthy wood undertones and some spice with the Aniseed and Ginger. The yellow colour is from the Beta Carotene. I wanted red mica but couldn't source one quickly so went with a mix of crimson and rosewood which seems to have translated to watermelon. My wife straight out doesn't like it but I'll still try it out on some unsuspecting friends and family. 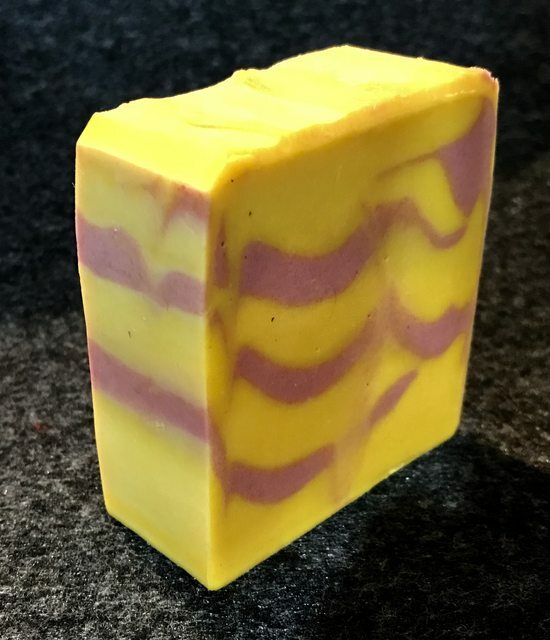 I did do a test single bar in hot process before I did this batch in cold process to see how it would go and the Beta Carotene was a little stronger which sent the shower water yellow but didn't give me a tan. It was always a hand soap project but I'm starting to wonder at its potential for shave soap. It would be a menthol soap with the Beta Carotene colour only (though I could introduce a red/brown clay). Do you think it would work? Have you ever try to make bath (well, it should be like hand soap I reckon) soap or shampoo bars? Hi @sealer , the formulation of the soap determines whether it’s best suited for hand/bath/shampoo bar. And they’re transferable to some degree. Some of the bath soap I make is conditioning enough to use as bath/shampoo bar. I was surprised at how soft they were on my hair. Great for travel as you don’t need to carry shampoo and conditioner just the one bar of soap. Phoenix is more suited for hand/bath soap but not for shampoo bar as it is not so conditioning and dries the hair a bit.